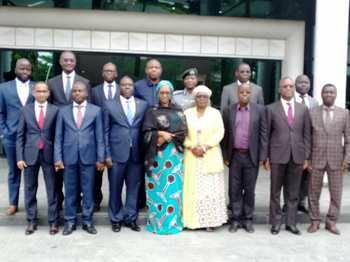 (Abuja, November 5, 2018:)The 4th Meeting of ECOWAS Ministers of Finance held on 2 November 2018 at the headquarters of ECOWAS Commission in Abuja, Federal Republic of Nigeria. A release from the Liberian Embassy in Abuja says Liberia’s Finance Minister, Honorable Samuel Tweah and counterparts from the ECOWAS region attended the meeting that witnessed the approval of several draft supplementary acts. The Ministers of Finance came from the Republics of Liberia, Benin, Burkina Faso, Cape Verde, Cote d’Ivoire, The Gambia and Ghana. Others came from the Republics of Guinea, Guinea Bissau, Niger, Senegal, Sierra Leone, Togo and host Nigeria. The release recalls that this year’s meeting was the fourth in the series of ECOWAS Finance Ministers’ Meetings which began four years earlier. The release adds that since then, the ECOWAS Finance Ministers’ Meetings are held annually to consider regional fiscal and customs matters. During the opening ceremony, the Nigerian Minister of Finance and Chair of the Meetings, Honorable Zainab Shamsuna Ahmed spoke on the consolidation of ecowas customs union and related fiscal matters. “These issues, if appropriately addressed, will help to improve the revenue and public health profiles of Member States through the efficient tracking or taxation of tobacco products, eliminate double taxation or illicit financial transactions, and institute strategies for development oriented tax treaties between Member States of ECOWAS and between us and other countries”, she stated. For his part, the President of the ECOWAS Commission, His Excellency Jean-Claude Kassi Brou, restated the Commission’s commitment to strengthening regional Customs Union and an infrastructural upgrade that can sustain the renewed integration efforts within the community. He maintained that in keeping alive the ECOWAS Vision 2020, what is envisaged is an ECOWAS which has a dynamic regional economy driven by a regionally-inclined business community that operates in an efficient and diversified regional production system. In her opening speech, the Vice President of the ECOWAS Commission, Her Excellency Finda Koroma, noted that a lot of progress has been made since the formation of ECOWAS some 43 years ago. She emphasized on the establishment of a Free Trade Area to the on-going efforts at consolidating the Customs Union. “However, expectedly, the journey has not been without challenges, such as conflicts and insurgency, which have had a negative impact on the economic stability of our region”, she added. Several draft supplementary acts were approved at the climax of the meeting. They included the draft Supplementary Acts on the Community Rules of Origin and Procedures Applicable to Products Originating in the Economic Community of West African States (ECOWAS); on Mutual Assistance and Cooperation between Customs Administrations of ECOWAS Member States and Collaboration between them and ECOWAS Commission in Customs matters and on the Change of Product Category in the ECOWAS Common External Tariff (CET). Stakeholders at the meetings also decided to postpone the consideration of the draft Directive on the Establishment of a Legal Framework for the Implementation of a Tracking, Tracing and tax Verification system of manufactured or Imported Tobacco Products in ECOWAS member States, pending the outcome of broader consultation with relevant stakeholders, mainly the private sector.